The holidays are here and you will need a super simple side dish to go with your delicious feast. 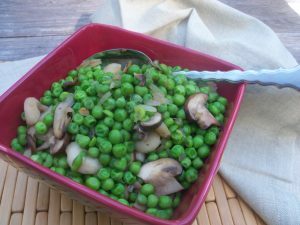 This is a very simple way to jazz up plain old peas by adding mushrooms, water chestnuts and soy sauce. If you don’t eat soy sauce, I used coconut aminos and salt to taste. Enjoy! In a large saucepan, saute the mushrooms and onion in butter. Add the peas, water chestnuts and soy sauce. Cook until heated through, about 10 minutes. 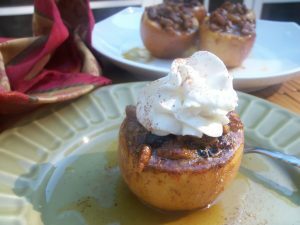 This was the first baked apple recipe I had ever tried and I’ve made them over and over so far this fall season. I fell in love with the combo of ingredients that spell fall to me. Crunchy nuts, tart cranberries, sweet raisins and fall spices fill these apples, then they are topped with a buttery sauce. Vanilla ice cream would be an amazing companion served along with fresh whipped topping. For my husband and I, using 5-6 smaller apples with just half of the filling and using the same cook time worked best. The smaller apples were a better serving size. Enjoy! Spray a 5 to 6 quart slow cooker with cooking spray. In a medium bowl, beat butter and brown sugar with a mixer at medium speed until fluffy, 2 to 3 minutes, stopping to scrape bowl. Stir in pecans, raisins, cranberries, pie spice, zest, and ginger. Cut 1/2 inch off top of apples. Using a melon baller or spoon, scoop out core and seeds of apples, making sure not to puncture bottom. Brush inside of apples with orange juice. Fill apples with butter mixture, and place in cooker. In a liquid measuring cup, add remaining orange juice and water as necessary to measure 1/2 cup; pour into cooker around apples. Cover and cook on low until tender, 1 to 1 1/2 hours. Using a slotted spoon, transfer apples to a serving platter; keep warm. Pour liquid in cooker into a small saucepan, and cook over medium heat until liquid is syrupy and reduced by half. Drizzle onto apples. Even though these carrots are a quick dish, I tend to only serve them when the weather is cooler, because they cook at 500 degrees. Nobody wants to be in a hot kitchen in the middle of summer! Baby carrots work great in this dish, but if you can’t find them just halve the larger ones lengthwise like I did this time and they come out great. This would be a great side dish for the up coming holidays, and it is also an easy recipe to cut in half for weeknight dinners. Enjoy! Place a small roasting pan in oven. Preheat oven and pan to 500 degrees. Stir together olive oil 1 Tbsp. butter in preheated pan. Add carrots, salt, and pepper; toss to coat. Bake 10 minutes. Meanwhile, melt remaining 2 Tbsp. butter in a small saucepan over medium-high heat. Add shallot; saute 1 minute. Remove from heat, and stir in bourbon and next 2 ingredients. Return to heat, and bring to a boil, stirring occasionally. Reduce heat to medium, and cook 5 minutes or until mixture is syrupy. Drizzle syrup over carrots; toss to coat. Bake 5 to 7 more minutes or until carrots are crisp-tender. Transfer to a serving dish, and sprinkle herb. Though our weather is not paying attention to the calendar, making this cake was a great welcome to the beginning of fall. I shared with friends and neighbors, which lit up my phone with ews and ahs on how amazing this cake is. A sweetened cream cheese filling with orange zest swirled into a batter filled with fall spices, apples and more orange zest, and topped with a confectioners’ sugar glaze. This cake is best eaten at room temperature, so after refrigerating remove prior to serving. Enjoy! Preheat oven to 325 degrees. Spray a 15-cup Bundt pan with baking spray with flour. For swirl: In a medium bowl, beat cream cheese with a mixer at medium speed until creamy. Add confectioners’ sugar, flour, egg, and zest, and beat until smooth, about 2 minutes, stopping occasionally to scrape sides of bowl. Cover and refrigerate. For batter: In a large bowl, whisk together flour, cinnamon, baking soda, salt, ginger, and nutmeg. In the work bowl of a stand mixer fitted with the paddle attachment, beat butter and brown sugar until fluffy, 2 to 3 minutes, stopping occasionally to scrape sides of bowl. Add eggs, one at a time, beating well after each addition. Shred apples using the large holes of a box grater. Coarsely chop shredded apples. Add apples, lemon juice, vanilla, and zest to batter, and beat for 1 minute. Gradually add flour mixture to apple mixture, beating just until combined. Spoon half of batter into prepared pan. Spoon swirl mixture onto batter, avoiding edges of pan. Top with remaining batter. Using a knife, pull blade back and forth through batter to swirl layers together. Smooth top of batter. Bake until a wooden pick inserted near center comes out clean, about 75 minutes. Let cool in pan for 10 minutes. Remove from pan, and let cool completely on a wire rack. 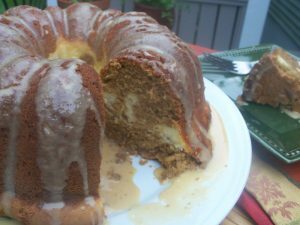 For Glaze: In a small bowl, whisk together all ingredients until smooth; drizzle onto cooled cake. Refrigerate cake in an airtight container for up to 3 days. **I substituted with 3 Tbsp. of brown sugar mixed with about 1/2 Tbsp. warm water. Here’s a different take on cabbage. 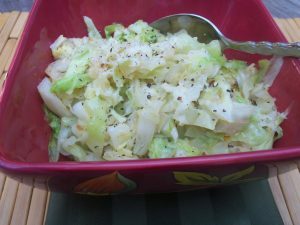 This is a super quick side dish that is different from any other cabbage dish I have had. Adding lemon zest, lemon juice and Parmesan cheese after a quick saute of cabbage brings a mild flavor and almost creamy texture. It doesn’t take much lemon juice before it is too lemony for my taste, so make sure to add a little and then taste. Enjoy! Heat oil in a large, heavy saute pan over high heat until smoking. Add the cabbage, spread it out, and sear for 90 seconds, you want it to be browned but not burned. Add 1/2 tsp. salt and lemon zest and stir, cooking for another couple of minutes, until cabbage is wilted but retains some of its crunch. Add lemon juice, a generous handful of Parmesan, and salt and pepper to taste, and serve. I now have a YouTube Channel. Check out my first video on how to store ginger root. Chorizo and smoked gouda take these jalapeno peppers to the next level. A simple appetizer or side dish that will have your friends and family coming back for more. If you don’t like a lot of heat, the key is to make sure you remove ALL of the seeds and pith, which is the white part of the pepper. Enjoy! Preheat oven to 375 degrees. Brown chorizo in a skillet over medium-high heat, about 8 to 10 minutes. Drain and place into a large mixing bowl. Add the cheese, red onion, egg, cream cheese, sour cream, hot sauce if using, and salt and pepper, to taste. Press into jalapeno halves and assemble on a parchment lined baking sheet. Bake until golden and bubbly, about 20 minutes. This is another recipe that just excites me! It is amazingly delicious, easy to prepare, a portable desert for a party, and a great gift. 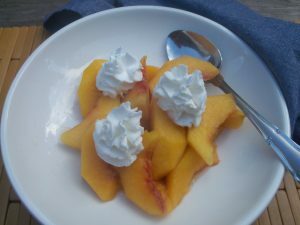 The longer you leave the peaches soaking the better they taste, but 1 hour is also good. You can use them to top ice cream, angel food cake, or just served with whipped topping or all of the above, of course. I also used less sugar than the recipe called for since there is sugar in the wine, which was perfect, so adjust according to your taste. Enjoy! Place peaches in a large mason jar. In a medium saucepan, add wine, sugar and orange peel and vanilla bean, and allow to reduce until 4 cups. once reduced, pour mixture over peaches in mason jar and close mason jar, allowing peaches to soak until tender, about 1 hour. 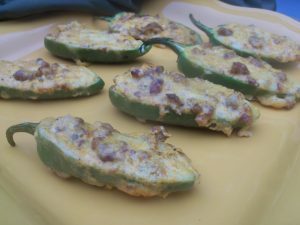 Here’s another great stuffed pepper recipe that I have been making all summer. Lasagna without noodles, and yes they taste like you’re eating lasagna. These are a great way to reduce your carbs without sacrificing flavor. Feel free to change it up by using ingredients you use for your pasta lasagna dish, like diced pepperoni or mushrooms. This is also very easy to reduce if you are only cooking for 1 or 2. Enjoy! Preheat oven to 400 degrees. Line a baking sheet with aluminum foil. Slice bell peppers in half lengthwise and remove ribs and seeds. Place pepper halves on baking sheet and bake for 20 minutes on the middle rack. Remove peppers from oven. 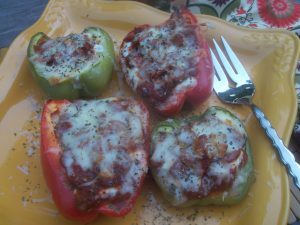 Fill each pepper with 1/4 cup tomato meat sauce. Next, spoon 2 tablespoons of ricotta cheese on top of the meat sauce in each pepper cup. Pour an additional 1 tablespoon meat sauce on top of the ricotta cheese. Top each pepper with 2 tablespoons mozzarella cheese. Bake on middle rack for 12 minutes. Remove peppers from oven. Top each pepper with 1 tablespoon Parmesan cheese and a sprinkle of Italian seasoning. Bake 5 additional minutes on top rack. When you need a super quick dish for your busy weeknight dinner, this Mahi is your answer. It’s packed with flavor and takes less than 15 minutes to prepare. The thickness of your fish filets determines if you need to cook them less than 6 minutes on each side. Remember, fish has carry over cooking, which means it continues to cook after removed from heat. The Chili Lime Butter adds just the right amount of seasoning with a hint of lime. Enjoy! 4 Tbsp. salted butter, room temp. For the Chili Lime Butter, in a small bowl, combine the butter, chili powder and lime zest. Stir to combine. Set aside. For the Mahi, heat a large skillet over medium high heat. Season the fish filets with salt and pepper on both sides. Melt the coconut oil in the hot pan, then add the fish filets. Cook about 6 minutes per side, until golden brown and the fish is cooked through with an internal temperature of 145 degrees. 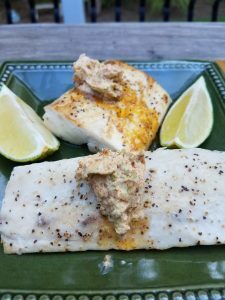 Transfer the cook fish to a plate and top with 1 tablespoon of the chili lime butter. Serve warm with wedges of lime.